Howdy all It’s been a few weeks but I’m back for a quick post,, BUSY BUSY SHOW and not a lot of free time to spare!!! So without hesitation here is a a speedy story about the flying police cycle from JJ”s Trek 09. The concept began as a pretty big bike, more of a helicopter size craft and it took a few long passes at the drawing board to get the copter version layed out and approved. As time, story changes, and budget revisions took place the cycle had to scale down drastically to fit the new constraints and thus the flying speed bike came to be. As much fun as would have been to see the big version I have to say this smaller bike really was a very cool departure and one big treat to see on the screen. The size screamed police more so than the previous and it was a good call on all fronts. The bike went through a few design changes and what you see in today’s sketch was the final design. At Comicon 09 the prop was in a corner of the Mattel booth and it was great to finally get some pictures of her. SO with all that said time to get back to work so enjoy today’s post and have a great weekend. So Sorry for this very late post, but we lost our internet for the last three weeks and only just got it back up and working. With that said, the last post of the year was to be about Grant McCune and all the modelers at his shop, but sadly, before it was finished news of Grant’s untimely passing changed the story from one of great fun to one of horrible sadness. 2010 has been a hard year full of many sorrows and tragedies. We have lost a lot of Hollywood legends and dear friends, and as the year comes to a close there is one more final goodbye to a dear, dear friend. If you’re a regular reader here, the name Grant McCune is not a new one to you, and with great sadness, Grant passed away on Monday December the 27th of Pancreatic Cancer which he was only diagnosed with 4 weeks prior to his passing. For those of you who don’t know of Grant from a friend’s point of view, he was the chief model maker on a little film that came out in 1977 called “Star Wars” and his masterful craft won him an Oscar. Grant was always a little embarrassed about that because it was really his first film in many ways, and being the humble man that he was, always felt funny about it. Grant started in the business working with his good friend Bill Shourt on the Mechanical Shark from Steven Spielberg’s “Jaws”. Bill and Grant went from working under water to outer space when George Lucas was putting together a team of specialists to create the undiscovered country of major motion control VFX for his space epic “Star Wars”. The Original Industrial Light and Magic VFX studio was a rented warehouse in Van Nuys, California, right next to the Van Nuys Airport. Star Wars was a landmark film and opened the door to a new world of VFX laden films incorporating Motion Control camera systems and technologies designed and created for Star Wars. Lucas was signed on to do a sequel and he wanted to move his operation up to the Bay area which was George’s stomping grounds. A call was made to see who wanted to follow to a new ILM to be situated in Marin County just north of San Francisco, and who was going to stay in Los Angelas. John Dykstra and six others of the main group decided to stay in southern CA while the others moved on. John Dykstra, Bill Shourt, Grant McCune, Richard Alexander, Roger Dorney, Doug Smith and Bob Sheperd got their money together and formed a new company called “Apogee”. Apogee retained the original building plus one directly next door to house all the new cameras, machine shop, creature shop, optical and animation department, model shop, and lots of stage and office space. Their first project was the television pilot and series called “Battlestar Galactica”. Grant would head up the model shop, and crews of modelers would come and go as the projects came in. Following Galactica came Star Trek (The Motion Picture), Caddyshack, Firefox and a host of other films and commercials. I knew of Grant from the credits in Star Wars and from all the publications about the films VFX sequences. After years of research I found an add for Apogee in a trade magazine for film and gave him a call. We met in early 1984 and for the next year and a half I would frequently make the drive from Arizona to visit. One hot summer Wednesday in July I stopped by again to say hi. I was staying at my uncle’s house in Fullerton and doing some side work for him while I was on vacation from my job at the grocery store in Phoenix. I told Grant in a joking way that I lived here now, and he said; you live in CALIFORNIA!!! Why yes I do,,,,, he then said, how do you like working outside….. in the heat??? I had just come from 120 degree Arizona heat to California which was barely 100 degrees so hot outside was NOT California, HAAA! I said I love to work outside why? What came next was the big phrase that I thought I would never hear….. Good! would you like start working here tomorrow, your job will be brushing latex into a giant Dinosaur mold and he pointed outside to two half molds of a full sized T-Rex ! WOOOOOOOOOOO Oh yes I would love to, and he said; OK then see ya tomorrow at 7:00, and how does $7.00 an hour sound… That sounds Awesome Grant, Thanks and I will see you tomorrow I said and off I went to get ready for the big day!!!! What an unbelievable time! So on Thursday August 1st 1985 Grant McCune brought me into the world of VFX and one young boy’s dreams came true. I called my boss at Bayless markets and gave my two week notice over then phone and the sound of cheers rang out from everyone standing by the phone on the Arizona side of the line. Grant was a great boss, and you couldn’t really call him that because he was more a friend than a boss. Always quick with a joke and a laugh, he loved his job and he so gracefully shared all of what he knew with you. Everybody loved Grant and also working at Apogee; it was a place that felt more like a house full of your favorite relatives than a job. There was really no division between the high end and the low end of the crew, and everyone there was incredibly talented and a joy to be around. Grant was a music lover and was ever so fond of the Gypsy Kings, Linda Rondstant, Leon Redbone, Patsy Cline, and Gershwin’s Rhapsody in Blue. Every morning when he would get in, we would all be blessed by a shout from the door, DOES EVERYONE LOVE THEIR JOB, followed by one of his tunes. Frech fries and breakfest burritos were next in a day of usual favorites. “Invaders from Mars”, “Top Gun”, and “Spaceballs” were my first movies working with Grant and and through him I met some of my very best friends, Cory and Allen Faucher, Pete Gerrard, Glen Campbell, Bill and John Shourt, Robert Beilmere, James Spencer, Pat Denver, David Dryer, Lisa Wise, Debbie Nicoles, Carolyn Diltz, Mike Yost, Greg Jein, Monty Shook, and way too many others to mention here. As Hollywood goes, there would be times where the modelshop crew would float from Apogee to Boss Films, DreamQuest Images, Fantasy II, LA Effects group, and up north to ILM for other jobs, but we would all gladly come back to Grant and Apogee. The CGI world started to become the way of the future in the early 90’s and by about 1994 (it was provide it or die), which made up the new Hollywood attitude and about this time all the major model shops where coming to an end. Apogee’s final days were in 1995, and as the major VFX company closed it’s doors (literally over night), Grant retained his side of the company and formed his own VFX house under the new name of Grant McCune designs. Fifteen years later his company still stands and does various jobs for films and also in the capacity for specialty props and collectables. Grant was a master photographer as well and he had a darkroom set up at work which he was turning into his daughter Lilly’s new darkroom over the last month or so. Grant also had a full shop at his house and he would commute back and forth between the two with goods and parts created for whatever the current project was. There was nothing that he couldn’t do with his hands and imagination, and he so loved what he did!!! Grant’s wife Kathy was the subject of many of his photo themes and she was always quick with a tip on nutrition. Their children, son Cole and daughter Lilly were always around, and it was always a pleasure to see the McCune family in the shop. Grant was an extremely generous, kind, and grateful man and was always there to talk to and lend some advice no matter what the subject was. He was like a second father to me; he was my friend, my buddy, and a man I loved dearly. He will be missed deeply and his passing came way to quickly and the reality of this is not setting in easily with all of us who knew him. Life is oh so fragile so be sure to tell those around you that you love them often. Kathy McCune and all the gang at GMD want to carry on with what Grant had started and happily his shop will be staying open. It will always be a landmark of where the true magic of working in the movies began for all of those that worked and visited there. God bless you dear friend Grant, and love to Kathy, Cole, and Lilly. Here are some pictures of Grant at work and, as soon as I can find all of mine, I’ll be sure to do an update. Grant came to Scottsdale Arizona to do a talk on VFX and this was the cover story from our local paper. This still hangs in my office today. 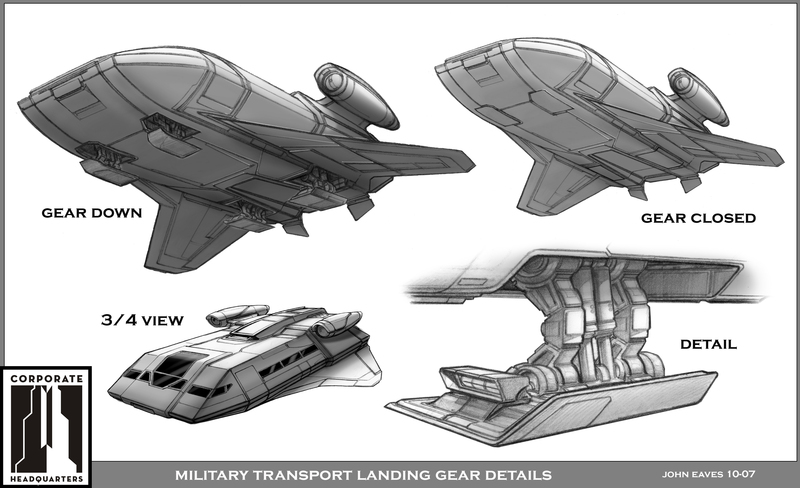 Here are some images from the final designs that would become the military shuttle during Kirks academy days. 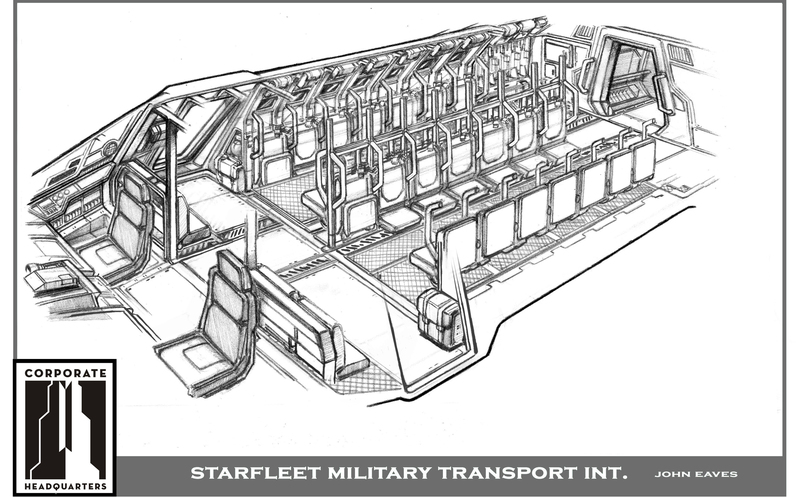 This one took a while to get to this point because we had a lot of budget issues to put into the design on how to modify this blueprint to double and triple for the other shuttles that would be represented in the final film… After a long design process this was the concept that moved forward, and it did get redressed to accommodate the many different ships you see in the bay and in flight. 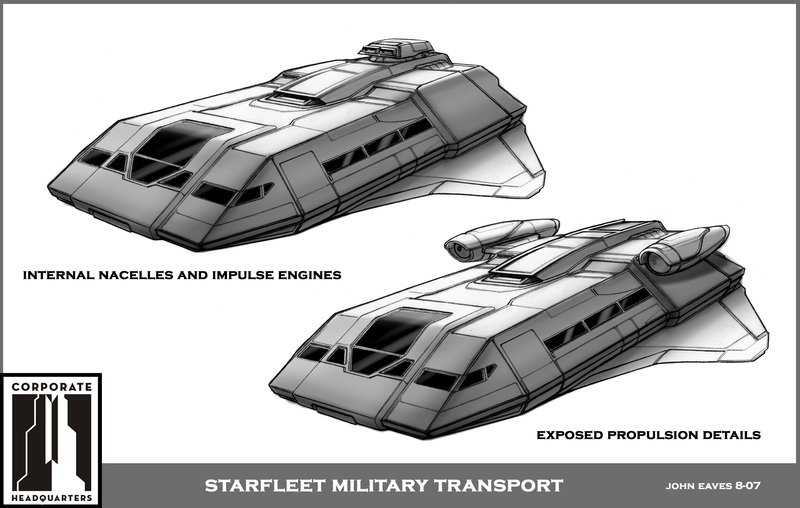 The initial design of the high nacelles came early on but we went through a lot of different ideas and changes before this idea came back to be modified into what you see in the sketches. 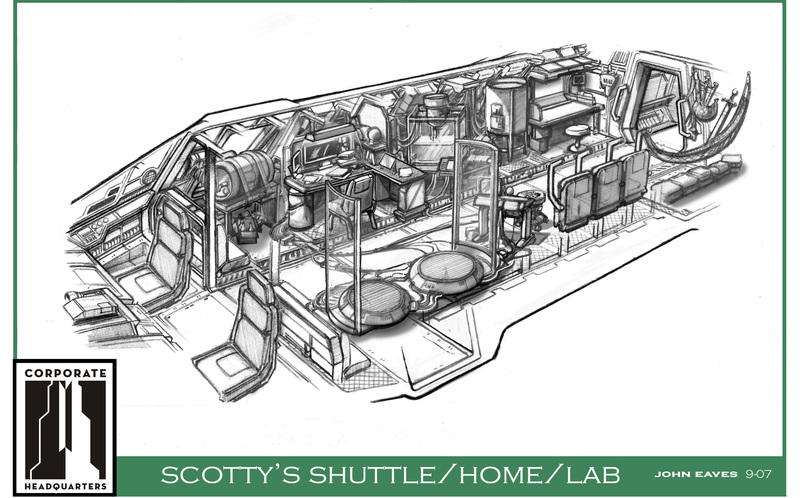 The windows changed drastically from this version and this one aslo was to be where Scotty lived and worked on Delta Vega,, The two interiors are the same just redressed for the military version verses Scotty’s version,, Scotty’s interior features all of his transporter ideas and studies as well as a lot of Scottish/and original series personal artifacts. lots of fun where these drawings to work on and I was collaborating closely with (art Director) Curt Beech on these and we had a good time. He’s one funny and talented man with an endless supply of pranks and jokes. In the end he did suffer from the dreaded Limburger cheese attack, HAAA!!!! some real good times. 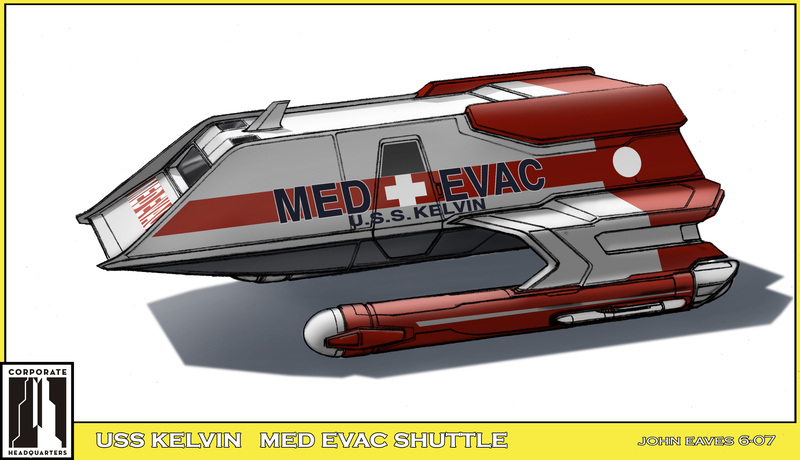 We’re getting to the end of the Iowa/Kelvin concepts, and here are a few of the final ideas. 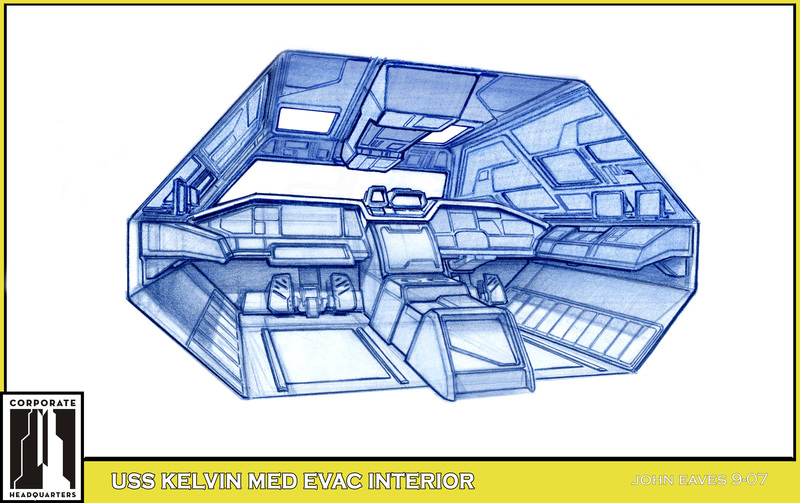 The exterior was a color layout test for the med-evac version of the shuttle and the interior views. The cockpit shown here has two different layouts, one has an off center doorway and asymmetrical floor-plan while the other has a central floor mounted console. 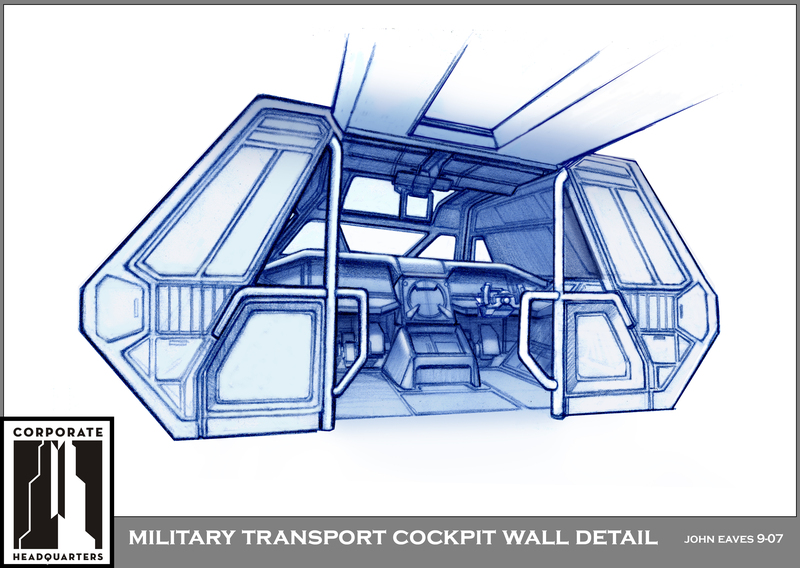 Both were ideas that had to be tossed around with how much would it take to redress the final set for interiors for other shuttles. In the end, the asymmetrical concept was scrapped for the easier straight forward layout. It was a treat to work on both the exterior and interior views, and this one had a lot of variations before it got to this stage. 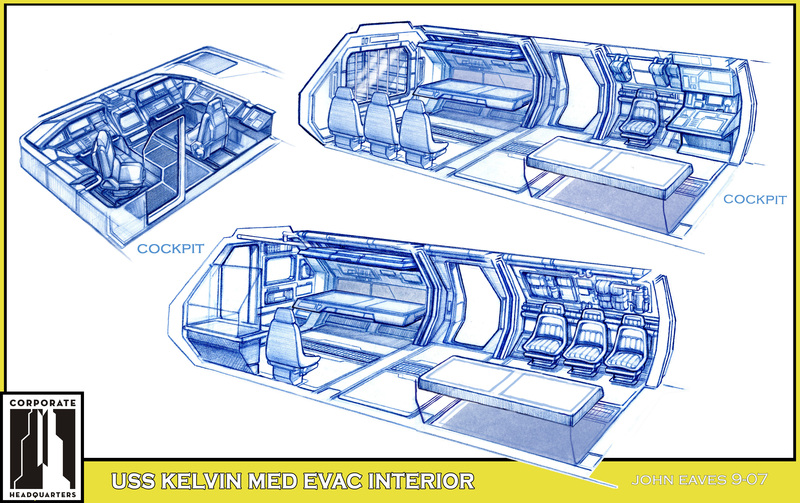 From the art department’s line of assembly, these sketches would get the green light from our production designer, Scott Chambliss, then go to art director Curt Beech, who would then do some layouts and sketch up models to coordinate the final dimensions for the blueprint stage and then construction. Next Clint Schultz the graphics designer would run with the drawings to make his own versions for graphics color, text and all the layouts for playback. As all of this is happening, Jeff Frost, the model maker, builds a little scale miniature, and finally Joe Hiura builds the 3D model CG style for the VFX group and the modelers at ILM. Lots of great talent in so many fields!!! The collaborative process on this film was awesome, and the end results were pretty darned cool. Enjoy today’s posts and back on Monday with some more fun stuff, happy weekend everybody.